Port Chester Hall at the train station has changed its name to Heartland Black + Gold. Piero's Italian Restaurant closed at the end of August at 44 South Regent St. after a long ride at that Port Chester location. It is moving to 123 Halstead Ave. in Harrison where Halstead Avenue Bistro used to be. The owners, Peter and André Rosaspina, sons of now-retired Piero Rosaspina, for whom the restaurant is named, are keeping the same name and phone number, according to Peter. They chose this space in Harrison because it is similar in size to their old place-they wanted to maintain the cozy atmosphere-but the bar is nicer. They are working on making this new location their own. No word on exactly when the new Piero's will open, but stay tuned. 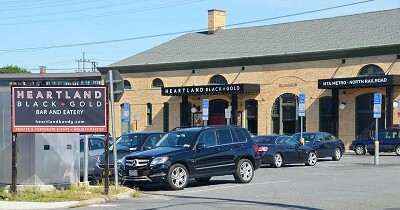 On Sept. 12, Port Chester Hall at the train station changed its name to Heartland Black + Gold. With the name change came a light renovation removing the train theme and a new menu. The alterations are meant to help the former restaurant and beer hall appeal to a wider audience. Finishes and furnishings have been changed and new artwork installed to create an eclectic exhibit of original photography along with prints of iconic figures. All these elements combine to create an environment that takes you out of the train station and into a "sexier" and alluring environment. Gone are the beer mugs and three sizes of beer which have been replaced with one size, served in a glass, for $7. The classic large pretzel with cheddar ale dip that was a big hit is no longer on the menu but still available. The new menu is arranged in three pricing categories so diners can make selections from $7, $11 and $15 sections including dishes like Moroccan Turkey Meatballs, Mussels with Thai Coconut Curry, Kobe Beef Sliders and Jerk Spiced Shrimp Skewers. The cocktail, wine and beer menu is simply structured with all beer $7, wine $8 and cocktails $10. All the Black + Gold beers, developed over 20 years, are brewed by Kelly Taylor, Heartland's award-winning brew master. Heartland's exclusive craft beer offerings include a harvest favorite for fall, Smiling Pumpkin Ale, made with honey-roasted pumpkins and simmered with ginger, cloves, cinnamon, and nutmeg. And for the cocktail lovers, there's The Black + Gold, a refreshing twist on summer made with fresh mint, orange and rye whiskey. Patsy's, the historic coal-oven pizzeria in East Harlem regarded as one of New York's original pizza joints and known for its traditional New York style thin crust pizza, is still coming to Port Chester. Founded in 1933 by Pasquale (Patsy) Lanceri, it is not to be confused with Patsy's Italian Restaurant located in Manhattan near Carnegie Hall since 1944. Although I thought the deal had fallen through because the owners were dragging their feet, Patsy's will be opening an Italian restaurant and pizzeria where Spadaro Ristorante briefly made a splash last summer. The space at 50 Abendroth Ave. it will occupy was totally renovated to accommodate Spadaro, but Patsy's proprietors are doing their own makeover and even moving the bar again. Work is currently taking place inside the space with no indication of when it might be completed. Patsy's has also opened locations in Nanuet and New Rochelle.